I’ve always joked that my kids are not true blue Singaporeans. They are generally averse to spicy food and hate durians, which is completely appalling to most South East Asians, let alone food-obsessed Singaporeans. I’ve nonetheless been gently ruthless in trying to change their palates. When kid #1 was younger I actually gave him a timeline that he had to eat curry by 10 years of age. And when his 10th birthday cake around, he actually managed to eat a mild curry and now in his late teens he actually likes biryani curries. Kid#2 is another proposition altogether however. She refused to comply with the “curry by 10 years old” target and barely manages peppery dishes even now. The one spicy dish she actually tolerates is Japanese curry. And this is not surprising as Japanese curry is barely spicy and is a sweeter and mellower distillate of traditional curries. I’ve been mulling making Japanese curry for quite a bit. 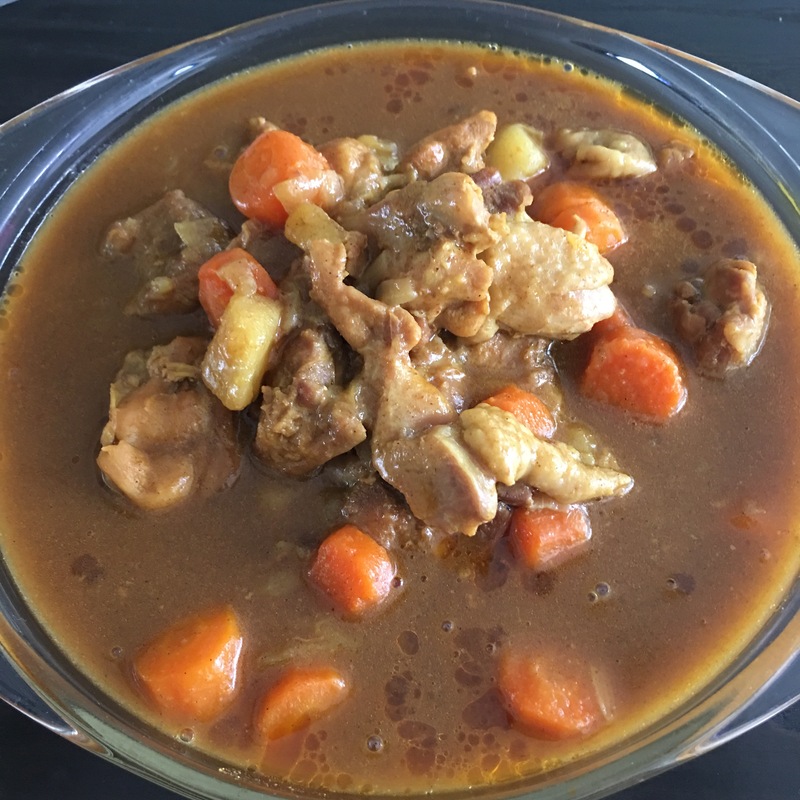 Japanese curry is really easy to make using the premade sauce or curry roux cubes. But the main problem is that the flour and added sugar in these premixes make Japanese curry off limits for me. I wasn’t quite sure how I would make it from scratch because most Japanese curry recipes from scratch also include apple purée or apple pieces to sweeten the curry. I had bought a can of SB brand Japanese curry powder, but had left it aside and almost forgotten it for quite a while. 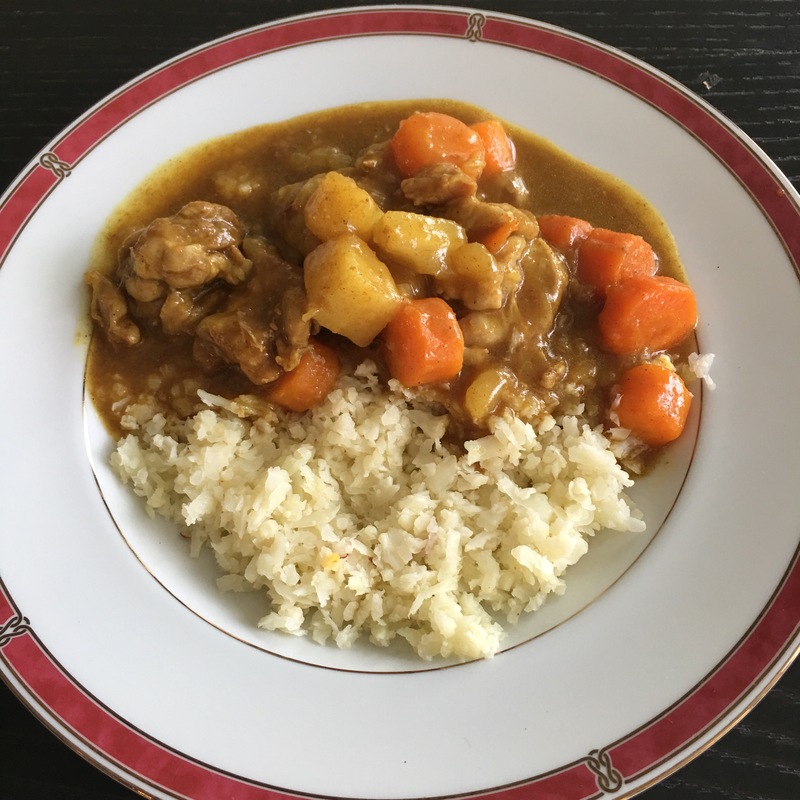 Recently however, I came across someone’s post of a homemade Japanese pork cutlet curry and it triggered a sudden craving and desire to make my own Japanese curry. In the end this was a really quick and satisfying experiment. As usual, the Instant Pot made this a super quick affair (hurrah for instant gratification). The curry was made low carb as I used xanthan gum as a thickener instead of flour, and sugar substitute was used to give this mild curry some sweetness. Instead of potatoes, I used parsnips (parsnips are slightly carby but I can tolerate a little without spiking). The Japanese chicken curry took less than an hour to make and went great over plain cauliflower rice. Kid#2 gave this 2 thumbs up and this marks a milestone in her spice journey! Put the Instant Pot into sauté mode. Heat up the groundnut oil. Sauté the onions, carrots and parsnips for about 5 minutes until lightly caramelized. Add the chicken pieces in and stir through. Add the curry powder and sauté for another 5 minutes. Add the water, tomato paste, salt and fish sauce. The water should be just enough to immerse the chicken pieces. Turn off the sauté mode. Close the pot and put the valve into sealed position. Turn on the manual pressure cooker mode on high and set to 10 minutes. When done, allow normal pressure release for 5 minutes. Remove the chicken and vegetables and place into a casserole dish and set aside. Put the pot back into sauté mode. Sprinkle the xanthan gum over the remaining gravy and stir well. Allow the gravy to simmer about 10-15 minutes, reducing the gravy and thickening it. In the meantime, prepare the cauliflower rice. Put the cauliflower florets in a food processor and chop into small pellets. Heat up the oil in a pan and sauté the garlic and shallots till lightly caramelized. Add the cauliflower in as well as the salt and pepper and sauté another 6-8 minutes till just softened. Serve the cauliflower rice hot, with the curry on top. Fish sauce! You really like fish sauce don’t you!